It’s the stuff of nightmares -- getting trapped in a car with jammed seat belts and inoperable windows, or being trapped outside a car with a child stuck inside. No one likes to dwell on the scary scenarios that could occur in a car accident, but it’s important to be prepared for emergencies. When every second counts, the portable ResQMe and LifeHammer could aid your escape. Both tools are designed to help if someone is trapped in a vehicle. 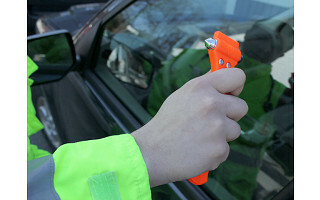 The hammer tips can break window glass (not windshields), and built-in blades can cut jammed seat belts. Laurent Colasse, who founded nov8 after learning how emergency hammers can reduce accident fatalities and injuries, says these car-escape tools are engineered to work even if a car is submerged in water. The LifeHammer has two hardened steel points and a recessed blade, and it comes with brackets for optional mounting inside a vehicle. ResQMe has a spring-loaded spike that can break window glass and a recessed blade, and it comes with a keychain ring so you can keep it handy. If you’re in a jam, a little protection can go a long way. We all know that motorists can never be too prepared for an unexpected accident and the risk of vehicular entrapment is becoming a real concern to most safety conscious drivers. Protect your family and your loved ones with our worldwide acclaimed safety solutions, LifeHammer® and ResQMe™. Certified, both devices have been quality-designed to cut through jammed seat belts and break car side windows to help people escape safely. I am the owner of the company, and I am available all day to answer your questions! Thank you and have a safe day. These are great safety tools that everyone should have in their cars! To clarify, however, it seems as though both tools serve the same purpose. Why would someone purchase both? Is the idea that the LifeHammer is more permanent for an individual car and the ResQMe portable to take with you? The LifeHammer is designed to remain inside your vehicle in an area within reach to the driver and passengers where as ResQMe is meant to be hold on your keys always. Our kids (and I think most kids) are very attracted to our keychains. What kind of safety catch is on the spring loaded spike in the keychain? @ Jasmine - That is a great question. There is no safety latch, but it's not going to release accidentally or with a little jostling. It requires about 12 lbs of pressure. If your children play with your keychain, we would suggest finding another place in the car where the ResQMe wouldn't be as accessible to a child. I would really like the orange key chain, are you sold out? It won't let me purchase the orange key chain, only the black. @Emily Carr - The orange has sold out. I hope the black will work for you! Are you going to be getting more of the hammers? They were actually featured in a previous episode of "Mythbusters," and I was hoping to get another one for our new vehicle.... thanks! @ Christine: We hope to have more by end of next week. Will be sure to contact you directly when they're available. Thank you for your interest. It’s the stuff of nightmares -- getting trapped in a car with jammed seat belts and inoperable windows, or being trapped outside a car with a child stuck inside. No one likes to dwell on the scary scenarios that could occur in a car accident, but it’s important to be prepared for emergencies. When every second counts, the portable ResQMe and LifeHammer could aid your escape. Both tools are designed to help if someone is trapped in a vehicle. 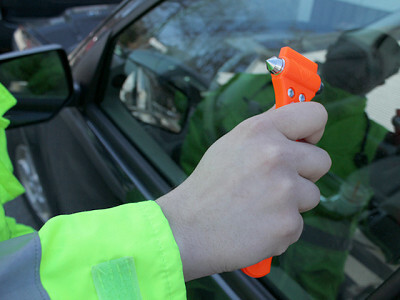 The hammer tips can break window glass (not windshields), and built-in blades can cut jammed seat belts. Laurent Colasse, who founded nov8 after learning how emergency hammers can reduce accident fatalities and injuries, says these car-escape tools are engineered to work even if a car is submerged in water.